Amaranth is a seed that is highly nutritious and very high in protein. Its a great addition to a grain-free diet. Like all pseudograins, it is gluten free. Here is a great way of using it to make crackers or crisps, it’s a useful tasty portable snack, great with dips or on its own. Its a healthy salt free, nut free, egg free, sugar free snack, great for children and adults alike. 1 part Amaranth to 2 parts water. Cook with a slow simmer, lid on for about 20-30 minutes until water is absorbed (check to make sure it doesn’t burn, and use a heat diffuser mat if your cook top’s lowest setting is too hot). 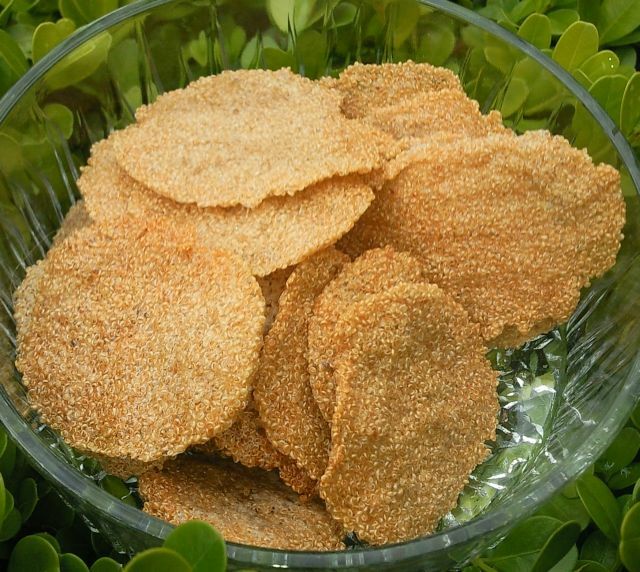 1/2 cup amaranth made about two large trays or crackers, but you can use any amount you like. The Amaranth cooks to a sticky porridge-like consistency. When cool, roll small 1/2″ or 1.5 cm balls and place on a tray lined with baking paper, allow enough space for them to be pressed down. Place a second piece of baking paper on top and with your fingertips press down gently until your rolled balls of amaranth are flat. Aim to get them uniformly thin but not so thin that they fall apart. Gently peel off the baking paper and neaten any edges with the edge of a spoon or knife if you like or leave rough, its up to you. Place in oven preheated to about 160 – 180°C (320 – 356 deg fahrenheit – not too hot, just a regular moderate oven temp). Cook for about 20 min or until you can see that they are lightly toasted. Remove from oven and remove onto a wire rack to cool. They will be crisp and firm and peel off easily from the baking paper. When cool they are perfect crackers / chips / crisps. They taste a bit like sesame. They are great on their own or use with dips. My children love them as a biscuit. This recipe is so easy my 4 year old made the ones in the picture. And then ate them. Can’t get better than that!